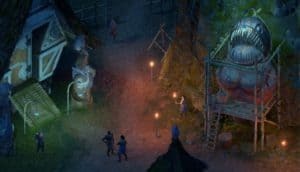 Pillars Of Eternity II: Deadfire Delayed Until May 8th | Nerd Much? Obsidian Entertainment has announced today that Pillars of Eternity II: Deadfire will have to be delayed until May 8th, 2018. This change of date is due to the game needing more polish. The developers also state that they need the time to incorporate all of the feedback they have received from the initial Backer Beta. Obsidian assures fans that there will be more news and updates as the date approaches. They want to be as candid as possible with the delay and show fans, especially the crowd-funding backers, what is happening with the game and the direction they are taking it. Pillars of Eternity II: Deadfire follows the story of Watcher of Caed Nua, which begins when an enormous statue returns to life via the god Eothas. Caed Nua almost dies in the resulting destruction, but he manages to survive. He must find out what Eothas’ plan is and whether or not he wants to help the god or not. On the way, Caed Nua will be meeting a “massive cast of characters” and explore a vast open world. As an update to the game, Deadfire’s relationship system is much more dynamic. In the new game, your companions will not only interact with you but with each other as well. Some of their interactions will depend on what decisions you make and the current events going on as you explore the world. The world will be almost entirely new, of course, with huge cities, volcanoes, sandbars, and so much more to discover. It won’t all be running about on foot either, you’ll have a ship named the Defiant for easy fast-travel. You can upgrade the Defiant to hold more crew members, take it into combat, and even buy bigger and better ships. If you are interested in Pillar’s of Eternity II: Deadfire, you can pre-order the game now on Steam and GOG for only $49.99 USD. There are special editions that are a bit more expensive but include all kinds go goodies, like an in-game pet, guidebook, and DLCs.